I've been tracking wildfires in West Texas via Weather Underground's interactive mapping feature. If you're not familiar with it, check it out when you have a moment. When you initially visit the preceding link, you'll see a generic Google Map. Use the "Map Controls" located beneath the map to select which options you want to display. If you click on the "Fire" option, you'll then get a set of related options including displays of smoke cover, fire perimeters, and satellite detected fires. I think the first and last feature are most helpful in staying current with the ongoing blazes; the second option shows a [depressing] picture of how much acreage has already gone up in smoke. The map is usable on a smartphone or iPad, but barely. It's slow to load and navigate. But on a desktop computer, it's very responsive. Of course, what many of us may not realize is that we in West Texas aren't alone in being threatened by wildfires. 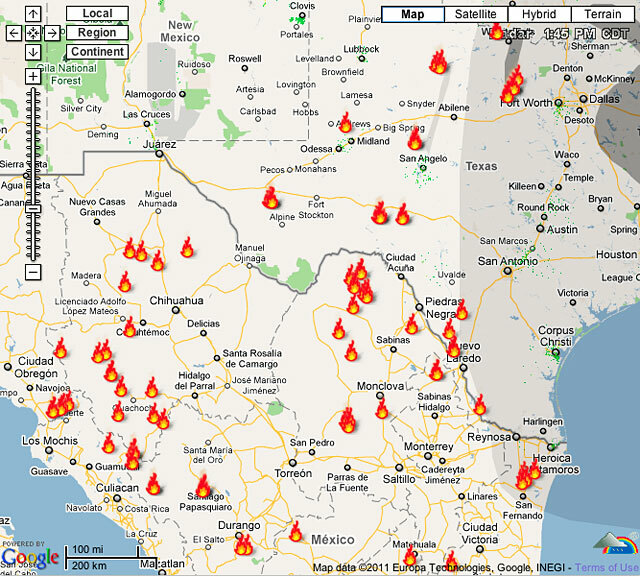 As the map below shows (a snapshot from just a few minutes ago), the interior of Mexico is also being plagued by fire. Indeed, much of the smoke cover that's hitting the Texas Gulf Coast is coming from those fires. I don't think I need to remind you...pray for rain! This page contains a single entry by Eric published on April 17, 2011 1:56 PM. When life gives you lemons... was the previous entry in this blog. Awesome Acrobatic Avocets! is the next entry in this blog.